The Inbound Blueprint is customized plan that fully leverages inbound marketing and software to grow your business. 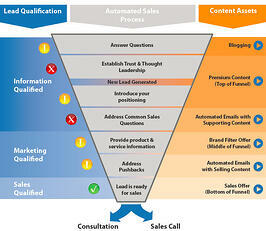 This plan aligns content your buyer's are looking for at each stage of their journey. 1) We start with a discovery process that captures your first-hand knowledge of your business, the reasons people buy from you, and the reasons they don’t. 2) This information is analyzed and mapped onto proven models inside Hubspot (and other marketing automation software) for attracting prospects and nurturing their interest to a point of qualified sales engagement. 3) The resulting plan and execution is a sales process unique to your business and specific to the value you provide and the challenges you have educating prospects about your value. We call this your sales engine.